The four main Balearic Islands – Mallorca, Ibiza, Menorca and Formentera – are situated in the Mediterranean and are the most attractive natural cruising areas of Spain. These islands are some of the Mediterranean’s prime transatlantic yacht transport destinations. Would you like to visit a prime destination? Take a look at our sailing schedules above! Nature has been generous to the Balearic Islands by creating many natural harbors, secluded coves and pretty anchorages. There is a lot to see both inland as well as in the ports along the coast. This region features a rich culture where the relaxed Spanish way of life still can be sampled in the many waterfront bars and restaurants. In addition to sailing there are many sporting opportunities such as golf, tennis, diving and horse riding. The islands make an excellent yacht transport destination, because they feature many beautiful sights including Gothic architecture, hidden beaches, endless orchards of oranges and olives and hilltop villages. Palma de Mallorca, the largest of the Balearics, is the island of contrasts. There is an incredible difference between its rough West Coast and flat East Coast that contains the small and picturesque fishing villages of Andraitx, Soller and Pollensa. Out of the 365 days in the year, these magnificent islands are blessed with sun on 300 of them. The peak season is summer in June, July and August, but the out of season weather is still quite pleasant. The capital, Palma, offers many cultural sights, restaurants and a dynamic nightlife. If you sail from Mallorca to Ibiza you will experience the joy of being accompanied by dolphins, and once you arrive in Ibiza there are many good marinas and hundreds of beautiful bays to explore. 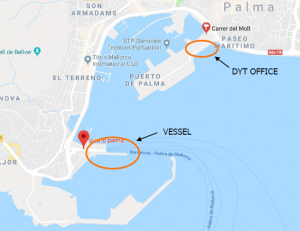 DYT Yacht Transport offers transatlantic yacht transport to Palma de Mallorca. This destination is ideal for clients who desire to visit the picturesque islands of the Mediterranean. Have questions about our international yacht transport? Learn more about how our unique transatlantic yacht transport works today! Area: total 5014 sq km (1935 sq miles). Mallorca: 3640 sq km (1405 sq miles). Menorca: 700 sq km (270 sq miles). Ibiza: 572 sq km (220 sq miles). Formentera: 100 sq km (38 sq miles). Religion: There is no official religion, but the majority of the population is Roman Catholic. The Canary Islands: GMT (GMT + 1 from last Sunday in March to Saturday before last Sunday in October). The weather situation of Mallorca is ruled by a temperate sub tropical climate of the Mediterranean. Normally summers are very dry and hot, but the winters are humid and mild. Bad weather is kept away by the mountain ranges. So the northwind that blows with up to 100 km per hour over the Mediterranean islands, is hindered to sweep over the whole island. Thus the precipitation per year of 1500 mm rain in the north west is much higher than in the south with only 400 mm. In the months November until April one has to expect strong rains on the whole island. The rest of the months almost have no rain. The maximum temperatures are not excessive, even in summer, owing to the cooling influence of the sea. Only August is characterised by high temperatures up to 40°C and high air humidity. The climate during the winter is mild and dry, and temperatures below zero are practically unknown. However, teperature can cool dramatically at high altitudes. The months April-June and September and October are the best times to visit. Mallorca’s international airport is about 8 km from the capital Palma. The island is such a popular destination that most international airlines fly direct. If you want to go via the mainland the cheapest flights tend to go from Barcelona and Valencia. Ferries to Mallorca also run from these cities and you can buy tickets in advance or at the ports.